So maybe some people got a head start, but COME ON. 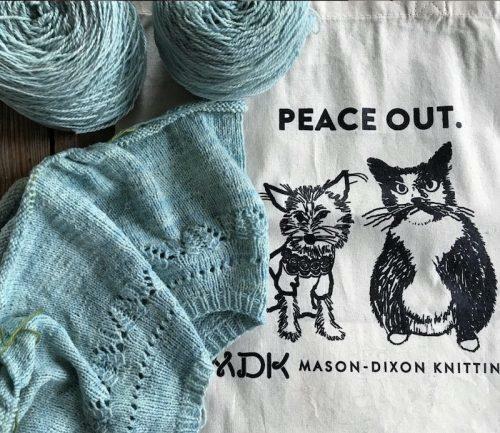 Here are some of the delightful Isabell Kraemer knits that are already going strong in the #MDKIsabellKAL hashtag on Instagram. Taking a page from Missy Elliott, Kelley Dew put her thing down, flipped it and reversed it. 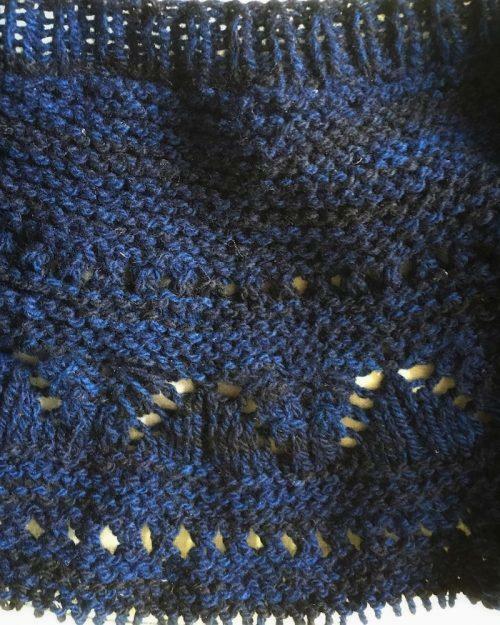 By which I mean to say that she modified the yoke detail on her Bottom Line Pullover by flipping the chart upside down and doing a double layer of openwork. Smart cookie! This is Mohonk Light in Bering, a minty blue-green. Here’s another clever, although less visible, mod. On her Bottom Line Pullover, Nell Ziroli did something I wish I’d thought of before I started in with the size 2s. Knowing her gauge was a bit loose on size 3 needles, she decided that she liked the fabric just fine, and simply knit a size smaller. Olive and Kermit are withholding judgment. They cannot be sure until they’ve napped on it. 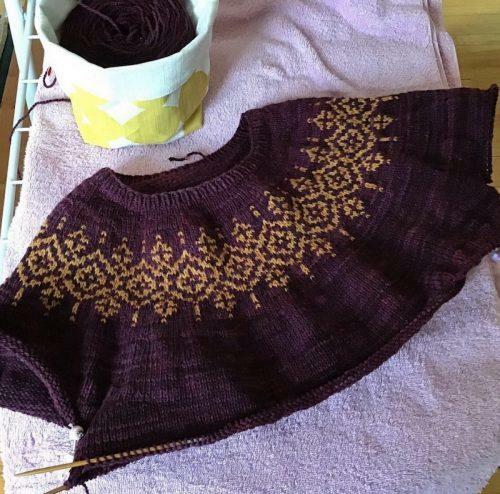 For her Petula Pullover in Jill Draper’s Mohonk, Iamgatt Julie picked a dramatic color combo: Black Cherry and Roasted Persimmon. It looks so fruity and delicious. Susan Forrester‘s Petula Pullover, in Vintage Denim Mohonk on a Bone background, is flying off the needles. She reports that “the stranded work was so easy,” and she has enough of the Vintage Denim left over to make a hat, just like Ann did. 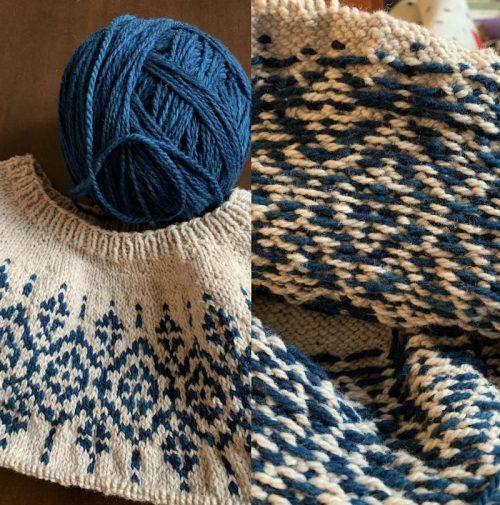 Here’s Cristina Shiffman‘s Bottom Line Pullover, in the Midnight Shade of Mohonk Light, after she changed her mind, pulled it all back, and cast it on again as a cardigan. Stay tuned for her mods, which we believe include switching the body from stockinette to garter stitch so as to avoid purling. Read ’em and weep. Or just give in and cast on, already. 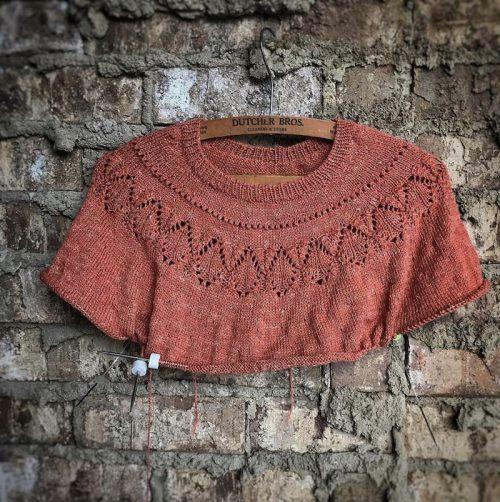 The Great Isabell Knitalong is a celebration of Isabell Kraemer’s delightfully wearable designs featured in MDK Field Guide No. 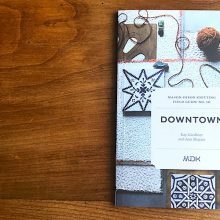 10: Downtown. If you’re currently at work on your Field Guide No. 10 project, guess what: you’re already in the knitalong. That was easy! If you’re ready to embark now, we’re here to welcome you with a big hug and a festive beverage (virtual but delicious). And if you’ve already completed a project, way to go! Bragging is encouraged. To keep up with the Great Isabell Knitalong, and contribute your two cents, here are two easy ways: follow the #MDKIsabellKAL hashtag on Instagram or join the knitalongers chatting and sharing in The Lounge. 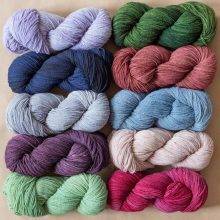 The knitalong will officially draw to a close on Friday, May 24, at which point we will give prizes to a few fabulous knitters for their efforts. You can get all your Great Isabell Knitalong fixings in our convenient one-stop pop-up shop. We can set you up with a fresh-baked Field Guide, the Jill Draper yarn of your choice, and notions up to and including the bag in which you will tote your project. Go forth and have fun, fellow kids! Dive in, the water's fine. And so are the sweaters. It’s Here: Field Guide No. 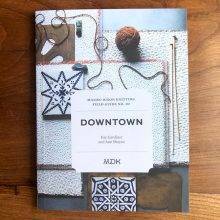 10: Downtown! All the projects look so lovely! The next couple weeks are hectic, but since the KAL is going on until late May, perhaps I’ll be able to cast on before it’s over. I’m eager to see what yarns I can buy at either Loop London or Le Bien Aimee in Paris, when I’m there next week. One lovely thing about IK patterns is that they are so well written, they go much faster than you ever think. I’m also dreaming of a short sleeve version of one of these sweaters, for summer evening wearing – and even faster finishing. Cardiganize… *snort*! I’m currently on the second side of my Savage Heart Cardigan, which I’m knitting in Mohonk. 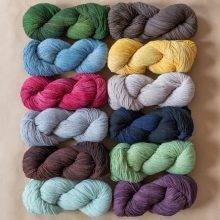 I can’t recommend this yarn highly enough. 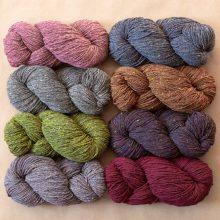 It’s wonderful and so fun to knit with, light, lofty, and it changes colors with the light. As we’re in the middle of the long stretch of no 3 day weekends in my school district, I probably won’t have it finished in time for this KAL, but I’m saving up for my next batch of Mohonk so I can knit Petula. Thank you for the lovely inspiration. I have some Mohonk Light in Black Cherry, I’m excited to see how beautifully the color works up. Gorgeous sweaters everyone! I like Kelly Dew’s modded Bottom Line Pullover even better than the original design. I may appropriate (steal) the mod for myself.